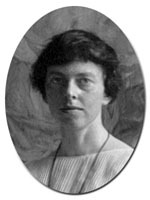 Helen Canon (1888 - 1954) came to Cornell in 1915 to assist Martha Van Rensselaer and Flora Rose with reading courses designed for New York State farm homemakers. Canon received her B.A. from Colorado College in 1911 and a B.S. from Teachers College, Columbia University in 1915. At Cornell, she began as an extension instructor in home economics, and after World War I, became an extension professor and the associate state leader of home demonstration agents. In 1928, she received her M.S. in Consumer Economics from Cornell. That same year, she made the first home survey designed to obtain budget information from farm families about how they spent their resources. In 1930, Canon received her Ph.D. from Cornell and was appointed the first head of the Department of Economics of the Household and Household Management, a position she held from 1930 until her retirement in 1952. Flora Rose said of Canon, "[She had a] goal whose objective was to give to women increased understanding of the importance of the economic structure of society and their significance as consumers and homemakers to [society's] welfare." During her long career at Cornell, Canon taught a variety of courses in the area of consumer economics including "Management of Individual Resources for Financial Security," "Economic Problems of the Household," and "Economic Conditions in Relation to the Welfare of Families." In addition, she wrote for the public, including leaflets during World War I and her Home Account Book (1951).